There a lot of rumours and myths about tax bands that aren’t true, and there are a lot of people out there who genuinely believe that if you work more, you can end up financially worse off. This article and video explains why our tax system prevents that from happening. A lot of people know about the tax free allowance which, this year, is £11,000. That means you can earn up to £11,000 without paying any income tax, although there is a small amount of national insurance. Anything you earn between £11,000 and £43,000, you pay 20% Income Tax and 12% National Insurance – or 32% tax overall. 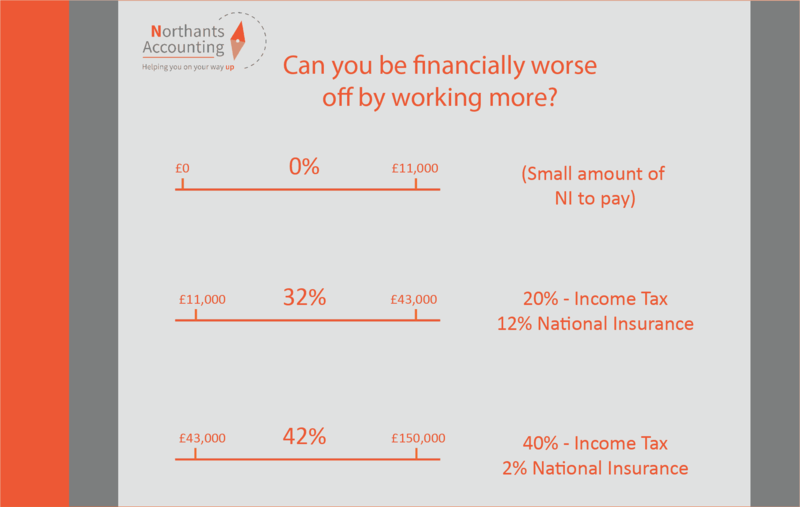 A lot of people believe that when you get to £43,000 and you go into the next tax band – where you will be taxed 40% plus 2% National Insurance – that 42% will apply to all of your salary. This is incorrect. If you earnt £46,000, the first £11,000 is tax free, you will have a small amount of National Insurance to pay. Anything between £11,000 and £43,000 will be taxed at 32% (20% Income Tax and 12% National Insurance.) Anything between £43,000 and £46,000 you would be taxed 42% on. Even if you earn that little bit more that pushes you into the next tax bracket you won’t end up being worse off directly from the tax system. There are other implications to think about, like tax credits and child benefits when you get to a certain point and that is something that we factor in for our clients. Purely from the tax system, you cannot be worse off just from working that little bit more.